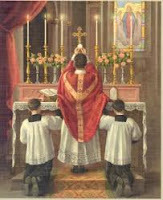 While the Second Vatican Council brought about many changes in the life of the Church there is no doubt in my mind that the most significant of these has been the changes that have taken place in the Mass as well is in the rites of the other sacraments. I was fortunate, I believe, to be in the seminary as the council unfolded and was well-educated in the reasons for the liturgical changes as well as in the changes in approach to the theology of the Church and the understanding of the Scriptures that went along with that. Unfortunately while the changes were implemented in many cases the faithful were not well educated in the reason for them. This, I believe, has led to many of the problems that the Church has had to deal with in the celebration of the Eucharist since that time. Without dwelling on problems I will say that without proper formation change seemed to many to be happening just for the sake of change. "They turned the altar around and are using English. What will they do next?" Many sought even more change that was not well grounded theologically and others sought to retrench into the past. Both tendencies are unfortunate. So what happened? Even before the council there was a loosely organized, but quite strong and widespread "liturgical movement". This movement encouraged wider participation by the laity and resulted in practices such as the dialogue Mass where the whole congregation said the responses, in Latin, that once were recited only by the altar servers. Gregorian chant, now considered so traditional, was re-etablished because it was simpler than some of the elaborate Mass arrangements that required trained choirs to sing. There was a strong push as well for the use of the vernacular language, including many bishops and theologians. The changes, then, did not happen in a vacuum. There was a previous impetus leading up to them as well as several principles set forth by the council and leading up to it. Almost everyone has heard of aggiornamento, Pope John XXIII's term for updating, literally "bringing up to the day". But have you heard of resourcement, or resourcing. Many theologians like Yves Congar and Henri de Lubac from France were calling for us to look back to the earlier theological resources of the first centuries of the Church and not to rely solely on the scholastic theology of the Middle Ages. Without rejecting the latter they called for a new look at the former.. It was this movement which led to the re-establishment of the Kiss of Peace and the Prayers of the Faithful, as well as the practice of concelebration by many priests at the same time. These things were not innovations but the recapturing of ancient practices. The council also insisted on "full, conscious and active participation in liturgical services" (Constitution on the Sqacred Liturgy, # 14.) as well as a liturgy which "respects and fosters the qualities and talents of the various races and nations. The call for active participation included increasing the role of the laity in formal liturgical roles such as lectoring and eventually. The several statements on cultural expression has led in my experience to some beautiful African, Oriental, Slavic and Hispanic liturgical celebrations. The Council did insist that some aspects of the Mass are unchangeable but that others may be adapted according to these principles. I grew up with the Tridentine (Council of Trent) Mass in Latin. I sang in a boy's choir and was fortunate to be in a parish where we children sang the high Mass every Sunday of the school year. I have a great appreciation for all that was represented in that way of worshiping. I have gregorian chant and Palestrina motets on my iPod. Nonetheless, I have grown to embrace the new rite for Mass and see the need for us to move forward with it so that we can develop an equally rich tradition as the one that is behind us. I will admit that there have been excesses in the implementation of changes, some of them merely silly, others outright wrong. I also think that some things were cast aside that the council never meant to cast aside and we need to re-claim those. But in this Year of Faith we need to move forward. 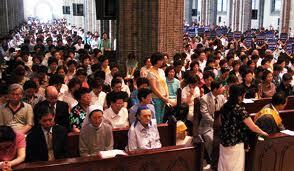 90% of the Church now lives in Asia, Africa and Latin America. Theologians and bishops in these places, most especially in Africa, attribute a great increase in the practice of the Catholic faith not only to superb missionary efforts, but also to the use of vernacular language and openness to cultural expression. The Mass in Latin was seen as a foreign ritual that rightly or wrongly kept many away. They can now celebrate the Eucharist in a manner and with an expression that is native to them and yet is the Eucharist in union with the whole Church. As we move forward in the Year of Faith let us deepen our understanding of the Mass. Let us realize that in theEucharist not only are bread and wine changed into the Body and Blood of Christ, but those of us who receive that Body and Blood are called to be changed and transformed by it so that we can be Christ in and for the world. Now it is time to continue where I left off on October 21 when I promised to highlight 3 facets of Vatican II and covered only one. I will take up the second of the three now--the role of the laity in the Church. It has been said that prior to Vatican II the role of the laity was "to pray, pay and obey." While this is certainly an exaggeration, it is not far from the truth. The parish in which I grew up, St. William's, in the Dorchester section of Boston had a robust number of activities for the laity. Most of them involved prayer and devotion, e.g. the Ladies Sodality and the Holy Name Society, and fund-raising for the parish. That was not bad, but the model was that of helping the priests to run the parish. The council made it clear that the laity working under the leadership of the clergy, are called to service and ministry in their own right by virtue of their Baptism and Confirmation (see Lumen Gentium (Constitution on the Church)# 33. Also in the previous section of that document it is clear that the laity are equally called to holiness, along with priests and religious, a theme that runs throughout the council documents. The result of this is that many lay people see themselves as "engaged in ministry" rather than as simply "helping out in the parish" Lay people have felt their voice and express it, often to the consternation of the clergy. Interestingly enough this applies to both the more liberal and the more conservative members of the laity. It has often been said that because of the clergy shortage that lay people are exercising more minstries in the Church. In the Diocese of St. Petersburg here in Florida where I live the chancellor of the diocese is a fine laywoman, Joan Morgan. Many faith formation programs are led by laypeople as well. This is the case in my summer parish in Eagle River, Wisconsin where Mrs. Adele Svetnica does a wonderful job in that role. I do not agree, however, with the sentiment that it is principally due to the lack of numbers among priests and religious. that this is so. Lay people, especialy in the western world, were becoming more and more well-educated after World War II. They themselves often read the council documents and were ready to lay claim to what the council taught. 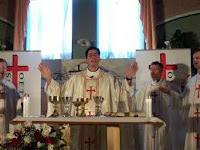 It is obvious too that lay participation in the liturgy has changed dramatically. Before Vatican II the only lay people to serve in the sanctuary were altar boys (and not girls). Now there are lectors, extraordinary minsters of the Eucharist and altar servers (girls as well as boys). I will say more about htis in my next reflection on the liturgy and the council. What is obvious is that the age of the laity is with us and it is not going away. My own Franciscan province has made partnering with the laity in all of our ministries a priority and many dioceses run formation programs for lay ministers. Even at that Vatican there is a council for the laity. This, I believe, is a welcome change. Finally, my own life as a priest and friar has been enriched by the laity with whom I have been involved, from the lay teachers at Columbus High School, to the couples on the Marriage Encounter weekend, to people in the parishes where I have served and Mrs. Linda English of Ridgewood, NJ and Mr. Pete Suarez of Miami, FL who have worked with the Ministry of the Word as lay preachers. The life of our Church is blessed today and is indeed a more complete expression of the mystery of the Body of Christ in the world because so many laity are serving in ministry. For those who have been following my Vatican II, Year of Faith, reflections they will continue. In the meantime the events of recent days have called me in another direction. On this All Saints Day morning I am sitting in northern Michigan preparing to fly home to Florida this afternoon. Even this far west of the Atlantic we have felt the effects of Sandy, though in a very minor way compared to the destruction that has been inflicted on the East Coast, especially in New Jersey and in New York City. As people of faith what are we to make of such a tragic event? First of all let me say that I am glad that I have not heard any nonsense about God punishing people there. People have asked though, "Why did God send us this storm?" I don't think that God sits in heaven and sends storms, earthquakes and other natural disasters our way. God not only did create the universe, but is still creating it. The universe has both life-giving beauty and terrifying destruction.The Creator has built in a natural cycle of death and renewal into the universe. We humans are placed on this planet in the midst of all of these forces of nature. The real question is "How do we deal with it? How do we respond when a natural disaster strikes? We are fortunate to have more advanced technology and things like weather radar that help us to forecast such things with more accuracy. With this tremendous storm the meteorologists were at their best and warnings were sent out. Most heeded the warnings. Some did not. Such is human nature. Even for those who prepared for what many called the "superstorm" the destruction wrought was beyond anything we might have imagined. I have friends in New Jersey and New York, as well as many of my fellow friars, and my prayers go out to them. It will take months and maybe years to fully repair all of the damage. As we move ahead what will it take to move forward, especially in the most ravished areas? 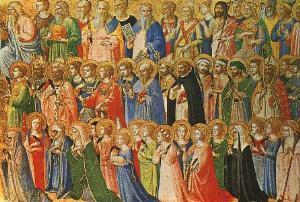 The answer lies in today's Feast of All Saints. It will take saints. No, not robed spirits sporting halos, but rather the saint, the holy one, the dwells in all of us. Yes, we are all sinners as well, weak and imperfect human beings, but saints, as they say, are nothing but sinners who have grown and are forgiven. To not only recover from hurricane Sandy, but also the economic and political mess that we are in will call forth the saint in all of us, the capacity to go beyond selfish interests and to pitch in and serve others. 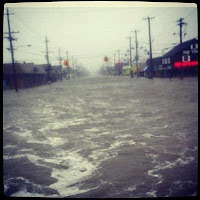 Whether it was the days after 9/11, or hurricane Katrina or now hurricane Sandy, our saintliness will be needed. And it will be seen in the short run. People of different political stripes will pitch in and work together. We have already seen some of that. The challenge is to strive to sustain that spirit as things get better, and not to despair if they get worse. We have a big election coming up with much at stake. Neither of the candidates and neither of the parties is fully satisfactory to me. I will have differences with whomever wins as well as areas of agreement. It will take the same kind of "saintly" working together to move our country forward as it takes to recover from this storm. Let us disagree with our leaders where we must, where our consciences tell us that this must be so, but let us fond enough common ground to move forward, to recover from all of the storms that threaten us. Of such is the Reign of God.